Storm: Hello everybody, in this lesson we will continue the 'Holiday Guitar' series with the Christmas classic 'O Come All Ye Faithful'. 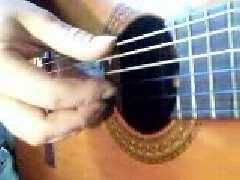 This lesson will feature a classical solo guitar arrangement. 'O Come All Ye Faithful' is commonly performed on the acoustic guitar, however you can play on the electric with a clean tone as well. 'O Come All Ye Faithful' is in the key of G featuring a nice 20 bar form. Here are the first two bars of the song, notice how the 'pickup note' is played before bar 1. Storm: Classical guitar is considered 'polyphonic' music, meaning the composition consists of two or more melody lines. Playing multiple lines is only attainable by using a fingerpicking technique. For this composition I use the thumb on the lower strings (E, A, D) of the chords and the index, middle and ring finger on the remaining higher strings (E, B, G), however at times I shift the fingers to the 4-3-2 strings (B, G, D). Storm: The picture above illustrates how my right hand is positioned. Try placing the thumb slightly forward of the fingers and horizontal on the string. Here are the next two bars, notice the familiar melody on the 'top notes' of the arrangement. Storm: Here are bars 5 and 6. Storm: The first two beats imply using an Em to A7 chord change. This section continues with a nice cadence to the following D major chord. Here are bars 7 and 8. Storm: The D chord is a perfect example of illustrating how you can alternate the fingers on strings 4-2. For the last chord I place my fingers on the 5th, 4th and 3rd strings, while the thumb plays the bass notes. Storm: Here's the second section of the song starting with the beginning of bars 9 and 10. Storm: The slashes indicate 'Chord over Bass Note'. In this example you have G over B.
bart: Which one is the chord? B? Storm: The chord comes first (left of the slash) and the bass note is to the right of the slash. In this case we have the G major chord over B bass note. Here are bars 11 and 12. Storm: At this point of the song the sections line up with the melody that comes in slightly before the bar lines. I tabbed the sections just as they would be sung, notice how the bar numbers overlap. Here is bars 12, 13 and 14. Storm: In this segment you have the same chord changes in bars 14-16 but this time with a higher melody line. Storm: Notice the new changes in bars 16-18. Storm: Here is bars 18-20, the last few bars of the song. Storm: I strum the last chord with my thumb and hold it for twice its stated value. This hold technique is called 'fermata'. Storm: More festive guitar next lesson, different song and different style!